Is the key to extended lives mechanical rather than medicinal? By the time we're beyond child-bearing age, our bodies are already on borrowed time. As far as evolution is concerned, your skin and bones have done their job. Any good mileage you get out of them before they start breaking down on you is a bonus. But over the last few hundred years we've been looking to change all that and, as medicine, hygiene and standards of living have improved, we've succeeded in slowing down the clock. Now that we're survivors, lasting now around twice as long as we should do, we're looking to add quality to that longevity. We want our golden years to be as fulfilling as the rest of our lives, and while our minds are a trickier battle, we're making advances on the body front thanks to the kinds of body replacements that we can wear on the outside. America's advanced research project agency, DARPA, began a programme in 2013, with the aim of preventing injury and fatigue to the country's soldiers, known as Warrior Web. The grunts on the ground have to hump around 45kg of weight on the backs, over long distances, on sometimes punishing terrain, and they often pick up problems on the weakest points, like the hip, knee and ankle joints. Warrior Web has challenged and funded US research groups to come up with lightweight, under-suit exoskeletons which can help lower that load to a 25% reduction in energy consumption. Two years on, and they're already beginning to see some impressive results. "One of the biggest and most interesting scientific challenges is that you have to treat the person and the exosuit as a system. So, how those two work together is interesting," explains Conor Walsh, founder of the Harvard Biodesign Lab and lead on the Wyss Institute's 'Soft Exosuit' offering to the Warrior Web. "No one person is the same; no one person walks the same. So, there's a lot of variability across different subjects both in how they work and how they respond, as well as how they learn to use these systems because, when you wear the device, there is a training period. You have to learn how to benefit from it." Unlike a rigid exoskeleton, the Wyss Soft Exosuit is neither heavy nor unrelenting to your body's natural locomotive wishes. It's made of smart, supportive textiles, which are both comfortable and designed in such a way as to support the muscles groups because the load paths that the suit creates match the functions of your tendons and tissues beneath. Integrated within that fabric is a series of soft sensors with the consistency of a stretchy silicon, specially developed at Harvard for this project, which monitor both the forces applied and the movements made. They then tell the batteries and motors, which are mounted at the waist, how much pressure to apply to a series of cables which transmit the required pulls to the joints at the right times. Throw in the idiosyncrasies of human motion and it's quite an orchestra to conduct. Nonetheless, the Harvard Soft Exosuit is getting some very positive results. It's just that how positive is not so easy to determine, as Walsh details. "Measuring fatigue is quite hard. So what we do is measure oxygen consumption or energy costs when a person is walking, and we have done some internal studies that show that we can get a 7% energy cost reduction when wearing the system. "What that 7% translates to as an extra distance that someone could march, well, nobody really knows the answer. My only one anecdotal evidence is that 7% might not seem like a lot but any kind of effect you have, you definitely notice that at the perceived end in benefit. But how you quantify and determine that for what it means in a task point of view, I doubt anyone knows what that means yet." While it's impressive to make any kind of advancement, though, 7% is still a long way off Warriors Web's target, but after only a couple of years on the case, Walsh is, without hesitation, still entirely optimistic. "It's an ambitious upper bound but it's definitely not unrealistic. It's challenging and it's hard but the signs say that going in that direction is very possible. "Realistically, I think we can crack it within the next three years. But it's hard to predict the future. Until 2014, no other group in the world had shown that you could make it easier to walk with a robotic device at all." Other groups, both across America and elsewhere, have focused their own projects on different aspects of the same goal. Hugh Herr and the Biomechatronics team at MIT designed a system to work specifically on the ankles. A pair of fibreglass struts apply the force from actuators mounted at the shin in a boot-type wearable arrangement, and through this they to have managed to demonstrate an energy cost reduction. Scientists at Ghent University in Belgium have a similar set-up but with pistons that pull the heel upwards whereas other centres have pointed their efforts at the hips or knees. DARPA's plans at this phase of Warrior Web is that some of these research centres begin to pair up and share the success they've had on their particular areas of the problem to eventually come up with a more holistic and complete solution. While a few groups have looked more at how to help carry heavy equipment, though, Walsh and Wyss's approach of minimising fatigue means that they can look at applications beyond those of the military. With the system of sensors in place, what's needed next is a way to determine what kinds of movement are characteristics of good walking and what is bad for the body too. Armed with that knowledge the Harvard Soft Exosuit can start to correct locomotion and guide people towards a more preferred trajectory or way of walking. That opens the door to applications both for people in the process of rehabilitation as well as those who are limited to their movements such as stroke patients who can walk but just not very well. "That's the more long term vision; everyday wear for these types of things," says Walsh. "There's a lot of question about how that would work. It's a little bit like a mobility assist device - like a hoverboard or a bike. If there's a benefit to help people walk more and stay active for longer, you can definitely see that happening. The next question that people ask, though, is - what if people rely on it too much? But it's hard to answer that kind of thing before the technology has even be invented." A more current analogue of soft exosuits might be a mobility scooter. Although there would be no need to suffer the disdain from onlookers because, fairly soon, the idea is to make these walking assist systems entirely invisible. "The long term vision is definitely something that can be worn under clothes," according to our man in Massachusetts, but that's not necessarily to say that we'll all be wearing them for a quick stroll to the shops, though. 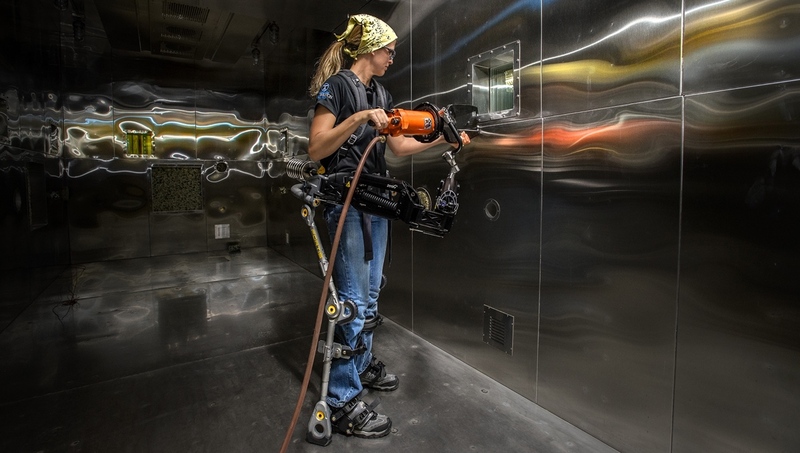 "I think these exosuits will end up as a more important consumer application," Walsh added. "I think those applications will be more specific but they could also be used for those who need mobility assistance for leisure activities such as hiking." A set of iLegs and realised dreams of being able to dunk a basketball might well be in the offing, then, and perhaps a whole lot sooner than you thought. "It's probably one of the hottest areas in robotics at the moment," says Walsh. "And wearables is a very hot topic too. Over the next 5-10 years, there's going to be an explosions like happened with the smartphone." Only another decade for my knees to hold out then.